Member of the German Stunt Association e.V. 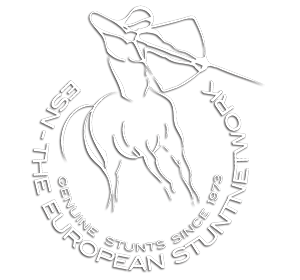 © 2018 ESN – THE EUROPEAN STUNTNETWORK GmbH. All right reserved. The contents of our website are created with the greatest of care. Nevertheless we cannot make any guarantee for the correctness, completeness and up-to-datedness of the contents. As a service provider we are responsible according to § 7 subs. 1 German Telemedia Act (TMG) for our own contents on these pages in accordance with general legislation. According to §§ 8 to 10 German Telemedia Act (TMG), as service providers we are however not obliged to monitor information that has been transmitted or stored or to research circumstances that would indicate an activity violating the law. Obligations to remove or to stop the use of information according to the general laws remain unaffected by this. Liability with respect to this is however only possible from the point in time onwards at which knowledge was gained regarding a concrete violation of rights. Upon gaining knowledge of corresponding infringements of rights we will immediately remove such contents. Our offering contains links to third-party websites, the contents of which are not subject to our influence. Therefore, we cannot make a guarantee for these third-party contents. For the contents of linked sites the responsibility lies with the respective offerer or operator of the website. The sites linked were checked for possible violations of rights at the time of linking. Legally violating contents were not recognizable at the time of linking. A permanent checking of the contents of the linked sites is however not reasonable without any concrete suspicions for a violation of rights. If such infringements of rights become known to us then such links will be immediately removed. The contents and works created on this website are subject to German copyright law. The copying or reproduction, processing and distribution and any kind of use beyond the limitations of German copyright law require our written consent. Copies of this website are granted only for private and not for commercial use. As far as the contents of this website are not created by us, the copyrights of third parties are respected. In particular the contents of third parties are marked as such. Should an infringement of copyright become known to you, please indicate this to us correspondingly. If an infringement of legal rights becomes known to us we will immediately remove such contents. The use of our website is generally possible without the stating of person-related data. If person-related data (e.g. name, address or email addresses) is collected on our website, then this takes place – as far as possible – always on a voluntary basis. This data will not be given to third parties without your express consent. We draw your attention to the fact that data transfer on the Internet (e.g. with communication via email) can pose security risks. It is impossible to completely safeguard against access to the data by third parties. Deadlines, conditions, orders etc. sent to us via email are therefore only valid when they are confirmed by us. The use by third parties of contact data published within the context of the obligation of imprint for sending advertising and information materials not expressly requested is hereby expressly objected to. We retain the right to all legal steps in the case of unwarranted sending of advertising information for example by means of spam mails.